People go through extraordinary things to get pearls from the deepest parts of the oceans. Many other will spend extravagant amounts of money to purchase items made from this unique material. You can now have the look of pearl without the cost with plastic plates for weddings. The Magnificence Pearl Plastic Plates look like the amazing material, but comes at a much lower price and less hassle. This plastic dinnerware is a fine addition to any wedding rehearsal dinner or special event. A Party Source is your one-stop shop for disposable plates for weddings. We have many different styles and colors to fit any color scheme. Get them today. Magnificence Pearl 10.25" Plastic Banquet Plates, 30ct. Magnificence Pearl 9" Plastic Luncheon Plates, 30ct. Magnificence Pearl 7.5" Plastic Salad Plates, 40ct. 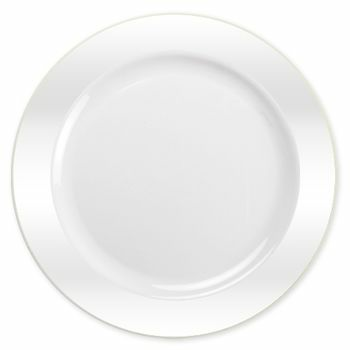 Magnificence Pearl 6.25" Plastic Dessert Plates, 40ct. Magnificence 14oz. Pearl Plastic Soup Bowls, 30ct. Magnificence 5oz. Pearl Plastic Dessert Bowls, 30ct.